191/365(+1), a photo by Luca Rossini on Flickr. It’s time for a postcard from Sardinia (the island of Tavolara, very close to Olbia, North of the region). 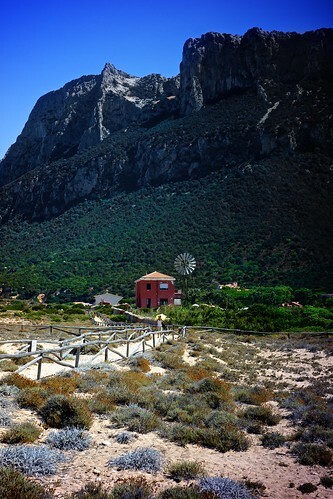 Sardinia is a wonderful land, ruled by a gentle wilderness, warm air and calm breezes. As in any Italian region, food and wine are great and people are nice. When on the boat there’s really not much else to do than relaxing. Already the very simple fact that you take the car out of the picture, changes your life and mood. No traffic, no parking, no needing for air conditioning, if you move you do it by sailing, if not you keep floating. In the afternoon we jumped into the little white tender and moved to the long beach of Tavolara. We had lots of swimming, playing, and then a nice lunch at the restaurant. During the remaining time, I took the camera and went for a walk in the inside of the island. As soon as you leave the shore, Sardinia shows you its real soft-wild face, with its rich colors (yellow, green, and blue), flavors (myrtle, mint, juniper, and eucalyptus), sounds (crickets, cicadas, and seagulls), and the never-ending sea breeze that makes a walk enjoyable despite the hottest hours of a summer day. a great homage to a great place on earth! well done!